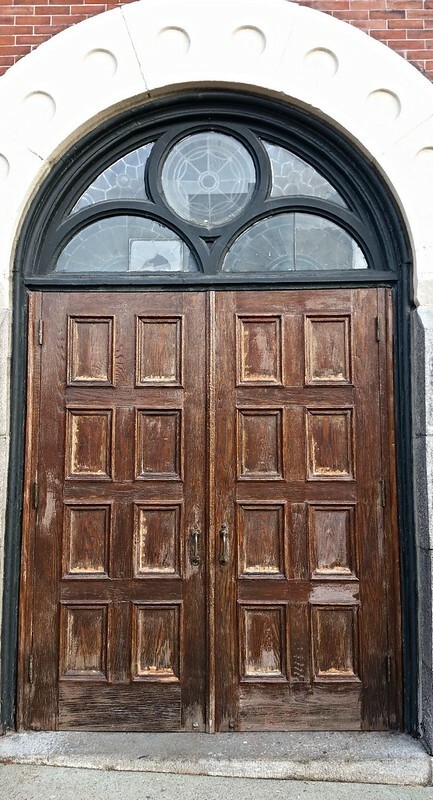 The broad wooden doorway to a church. Doorways are fascinating things. For anyone who has ready a good deal of science-fiction and fantasy (or horror for that matter), a doorway can represent a passage to some place new and far away. But the doorway itself is a fascinating marker of being in and out of a place. I can stand next to the door, touch the door, or lean against it, but I still have not passed through the door and still sit outside. This doorway with its broad wooden doors is a pretty demarcation of here and there and the glasswork above the pass is equally appealing. Yet I am surprised as I expected the glasswork to be stained glass or at least fogged glass.